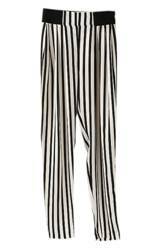 Giveaway dose: Black and White Striped Legging !! Do you like fashion? What is your favorite style? As for me, I am in favor of stripe. Stripe always gives me the sense of simplicity and nature. Nowadays, stripe has become one of the strongest elements in the fashion world. Regardless of the classic black and white stripes, or different tonal collocation of color stripe, or the stripe splicing combination, can be a necessary match for this summer. Here I want to show you my last order from ROMWE. My favorite one is leggings which is ROMWE’s own design. It is black and white with vertical stripes. They are so comfortable. They are almost wearable with everything like T-shirt, blouse, sweater and pullover. And I can pair it with many colors. The key point is they have a good quality with affordable price. All my friends around said the ROMWE Vertical Stripe Black-White Leggings look very good on me. And the vertical stripes make me look slimmer. Haha! They also wanted to have the leggings. 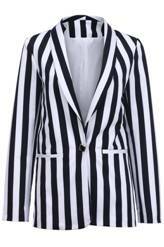 Now I am waiting for my new order of Black-white "Stripes" Maxi Dress and Stripe Double Pockets Shirt. I can not wait to wear them. I will try more striped clothing. Haha! I think simple choice makes perfect. Do you have a striped item? Do you want to have a try? ROMWE provides worldwide free shipping. New customers can see more products on ROMWE .They provide you with latest trends at affordable prices. You can also get a 20%off coupon for your first purchase.